Confucius once said, “A man who chases two rabbits catches neither!” In Star Wars Episode 1, Qui-Gon says to the young Jedi Anakin, “Always remember, your focus determines your reality.” There is an ounce of truth in that Jedi wisdom. A focused person usually attains his/her goals. At the end of a tiring day, if we focus on how tired we are, generally we will remain tired and end up vegetating in front of the TV set. If we re-focus the mind from being tired to needing to be healthy, there is a bigger likelihood we will exercise. It is easy to stray with all the distractions, TV, Internet and mobile devices that we have today. These distractions can lead us off-tangent, stealing our focusing power. Reflection corrects that. Reflection allows us to learn from mistakes. We all make mistakes I have done so spectacularly at times. We have all been in situations where things don't go exactly to plan. But how often do we take the time to sit down to reflect on where it all went wrong? In fact, the Kolb Learning Cycle, is based on the belief that learning for real comprehension comes from a sequence of experience, reflection, abstraction, and action. 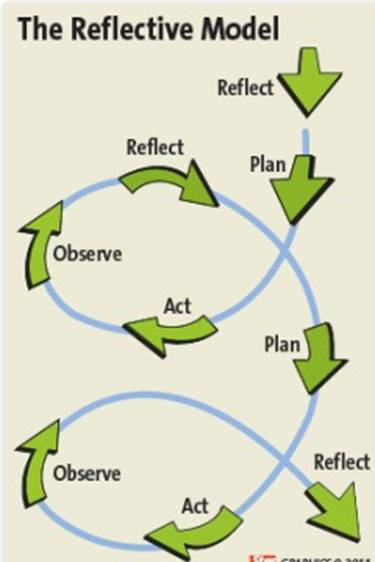 All learning can come only through reflection. A driver and the policemen.